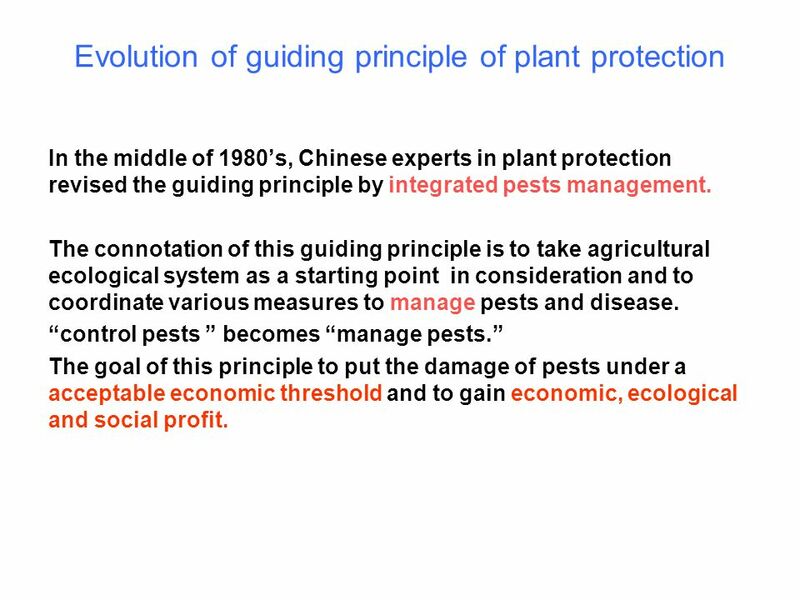 In the middle of 1980’s, Chinese experts in plant protection revised the guiding principle by integrated pests management. The connotation of this guiding principle is to take agricultural ecological system as a starting point in consideration and to coordinate various measures to manage pests and disease. “control pests ” becomes “manage pests.” The goal of this principle to put the damage of pests under a acceptable economic threshold and to gain economic, ecological and social profit. 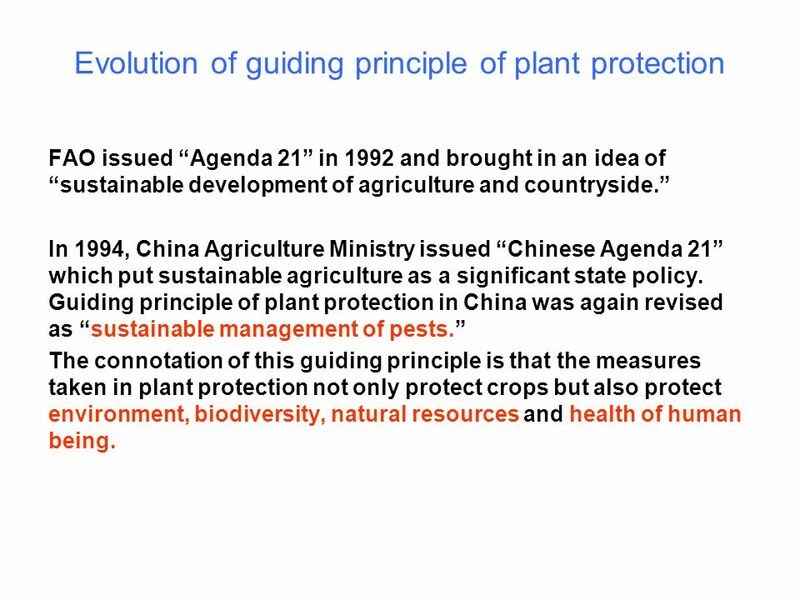 FAO issued “Agenda 21” in 1992 and brought in an idea of “sustainable development of agriculture and countryside.” In 1994, China Agriculture Ministry issued “Chinese Agenda 21” which put sustainable agriculture as a significant state policy. 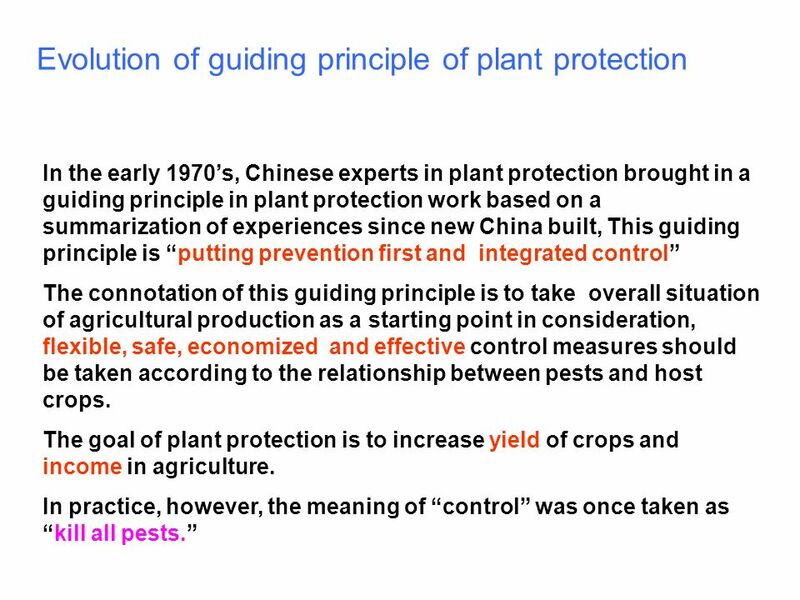 Guiding principle of plant protection in China was again revised as “sustainable management of pests.” The connotation of this guiding principle is that the measures taken in plant protection not only protect crops but also protect environment, biodiversity, natural resources and health of human being. China is the largest country in terms of population. By 2030, Chinese population will have reached 1.6 billion. In order to balance the food supply to Chinese people, we must mainly rely on self-sufficient in grain. According to estimation of 400kg grain consumption per capita per year, annually sum total output of grain crop must reach to 640 million tons in 2030, therefore, the yield per unit area has to increase by 55%-60% compared with that now. 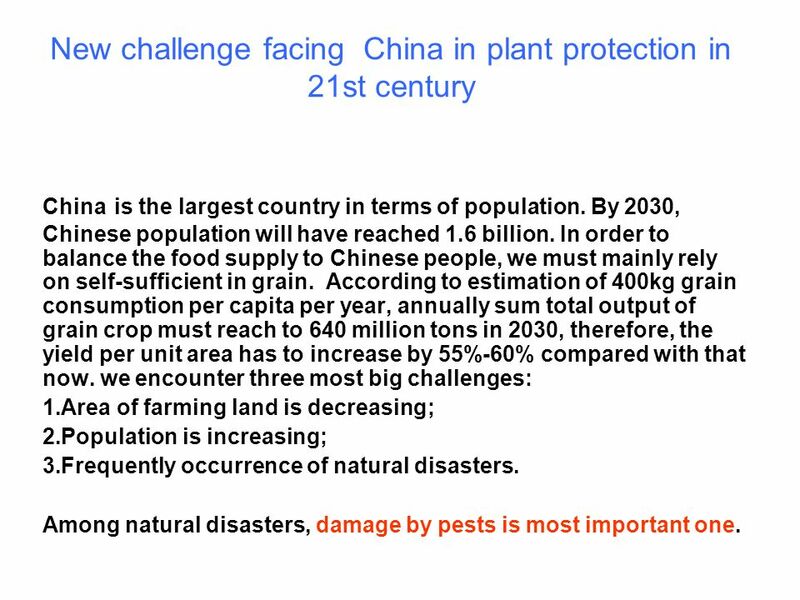 we encounter three most big challenges: Area of farming land is decreasing; Population is increasing; Frequently occurrence of natural disasters. Among natural disasters, damage by pests is most important one. Variation of biotypes or races of important insect pests or pathogens becomes more frequent Rice blast caused by fungus seriously occurs in many regions in China. 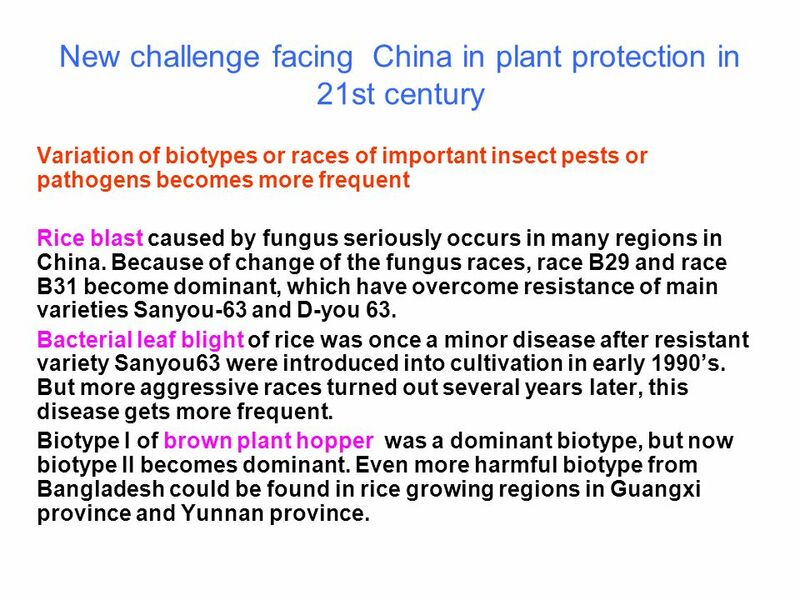 Because of change of the fungus races, race B29 and race B31 become dominant, which have overcome resistance of main varieties Sanyou-63 and D-you 63. Bacterial leaf blight of rice was once a minor disease after resistant variety Sanyou63 were introduced into cultivation in early 1990’s. But more aggressive races turned out several years later, this disease gets more frequent. Biotype I of brown plant hopper was a dominant biotype, but now biotype II becomes dominant. Even more harmful biotype from Bangladesh could be found in rice growing regions in Guangxi province and Yunnan province. 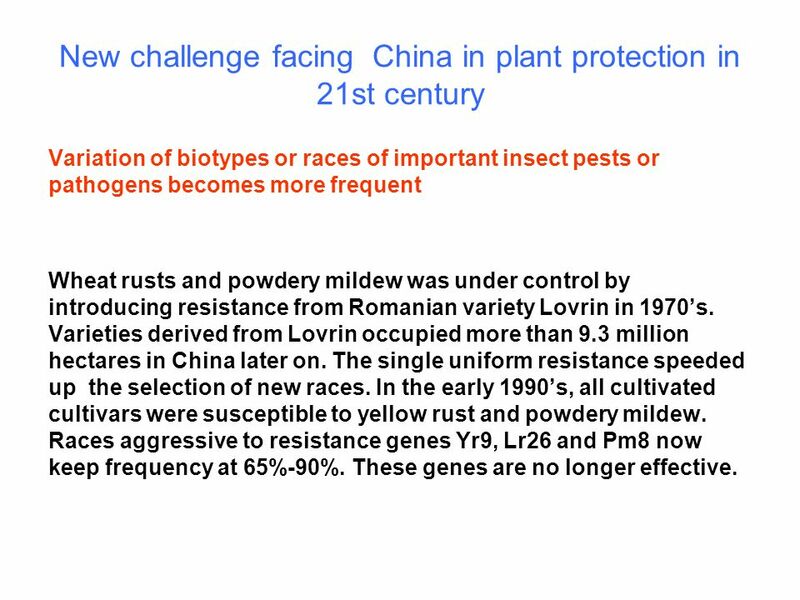 Variation of biotypes or races of important insect pests or pathogens becomes more frequent Wheat rusts and powdery mildew was under control by introducing resistance from Romanian variety Lovrin in 1970’s. Varieties derived from Lovrin occupied more than 9.3 million hectares in China later on. The single uniform resistance speeded up the selection of new races. In the early 1990’s, all cultivated cultivars were susceptible to yellow rust and powdery mildew. Races aggressive to resistance genes Yr9, Lr26 and Pm8 now keep frequency at 65%-90%. These genes are no longer effective. 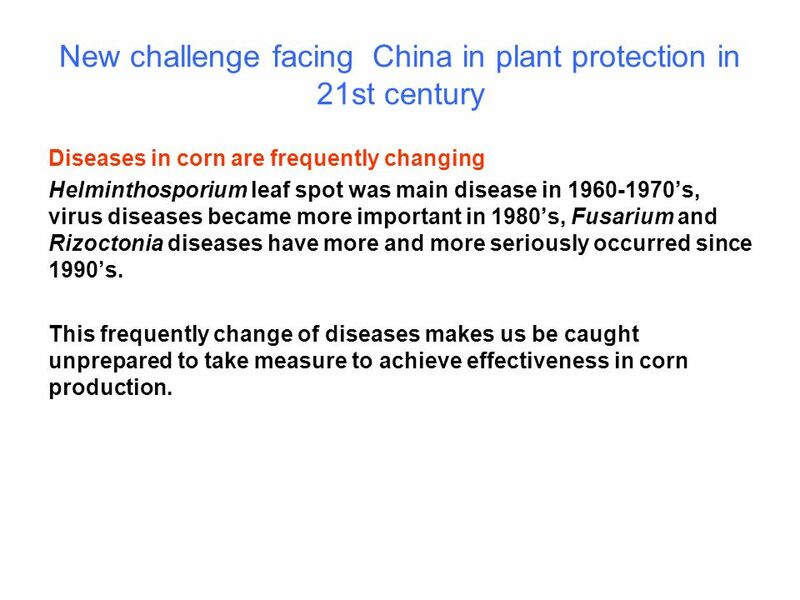 Diseases in corn are frequently changing Helminthosporium leaf spot was main disease in ’s, virus diseases became more important in 1980’s, Fusarium and Rizoctonia diseases have more and more seriously occurred since 1990’s. This frequently change of diseases makes us be caught unprepared to take measure to achieve effectiveness in corn production. 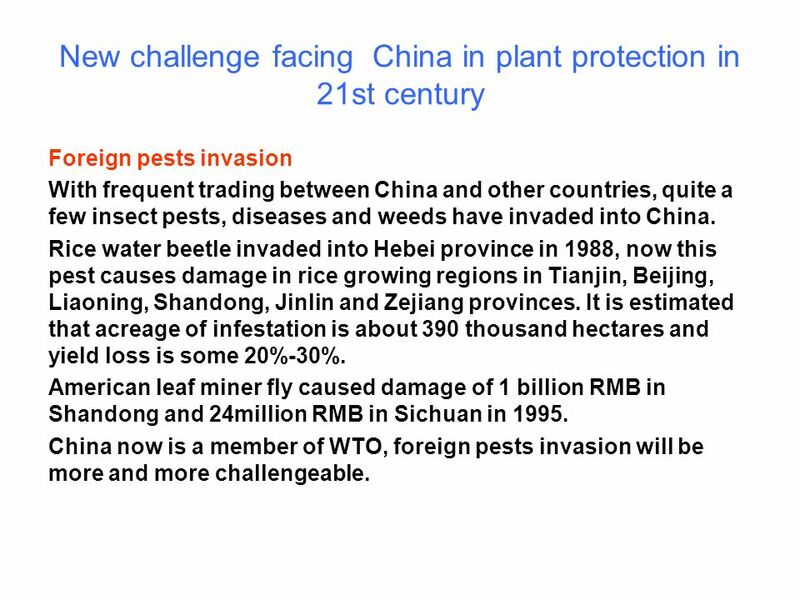 Foreign pests invasion With frequent trading between China and other countries, quite a few insect pests, diseases and weeds have invaded into China. Rice water beetle invaded into Hebei province in 1988, now this pest causes damage in rice growing regions in Tianjin, Beijing, Liaoning, Shandong, Jinlin and Zejiang provinces. It is estimated that acreage of infestation is about 390 thousand hectares and yield loss is some 20%-30%. American leaf miner fly caused damage of 1 billion RMB in Shandong and 24million RMB in Sichuan in 1995. China now is a member of WTO, foreign pests invasion will be more and more challengeable. 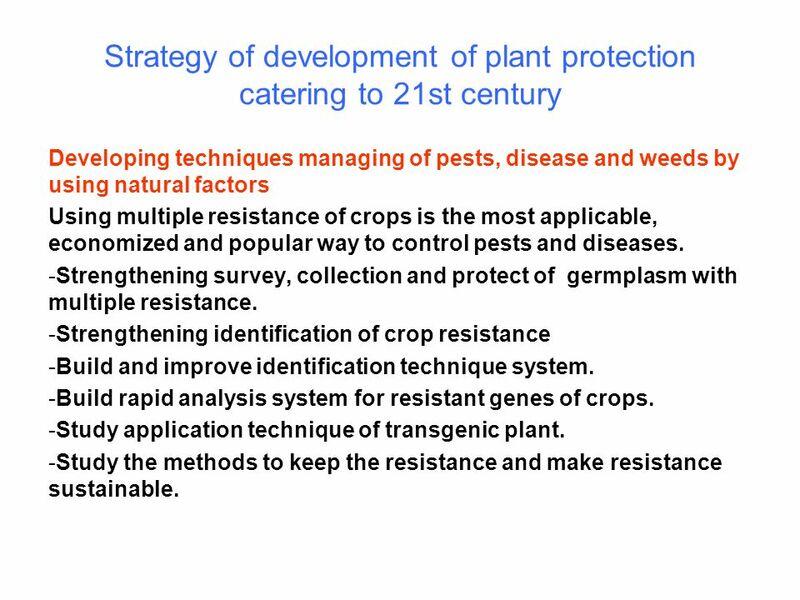 Resistance to agrochemicals in pests pathogens and weeds are tremendously increasing Agrochemicals have been playing an important role in disease and insect pests control, and correspondingly irrational use of agrochemicals greatly increases resistance in pests, pathogens and weeds. Resistance in cotton aphis, cotton bollworm, diamond back moth to organophosphorus pesticides has increased by several tens or several hundreds times, and to pyrethroid insecticides even up to 20 thousand times. 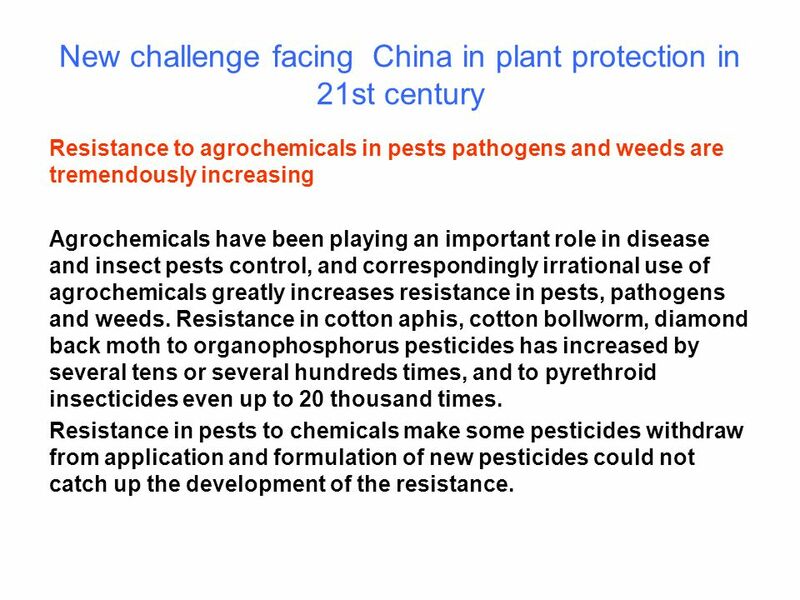 Resistance in pests to chemicals make some pesticides withdraw from application and formulation of new pesticides could not catch up the development of the resistance. Developing techniques managing of pests, disease and weeds by using natural factors Using multiple resistance of crops is the most applicable, economized and popular way to control pests and diseases. Strengthening survey, collection and protect of germplasm with multiple resistance. Strengthening identification of crop resistance Build and improve identification technique system. Build rapid analysis system for resistant genes of crops. Study application technique of transgenic plant. Study the methods to keep the resistance and make resistance sustainable. Developing techniques managing of pests, disease and weeds by using natural factors Application of natural enemies is an important method to control insect pests. 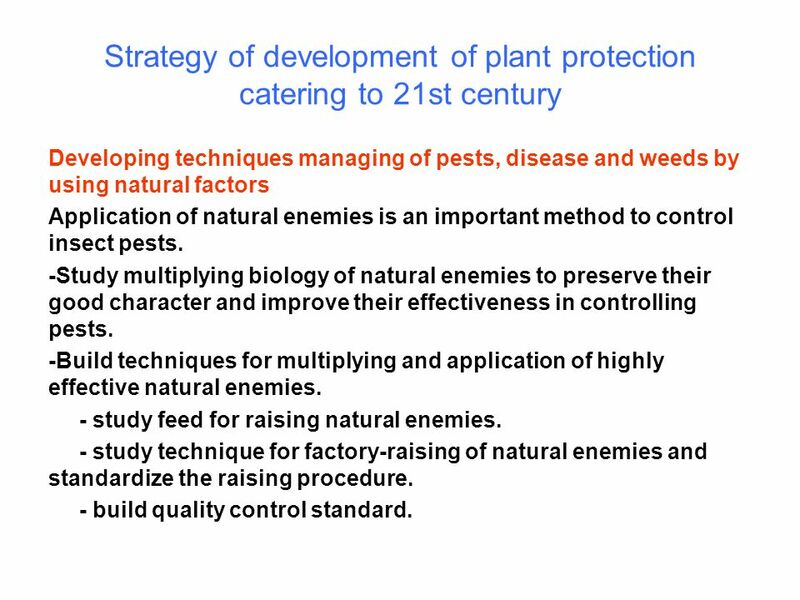 -Study multiplying biology of natural enemies to preserve their good character and improve their effectiveness in controlling pests. -Build techniques for multiplying and application of highly effective natural enemies. - study feed for raising natural enemies. - study technique for factory-raising of natural enemies and standardize the raising procedure. - build quality control standard. 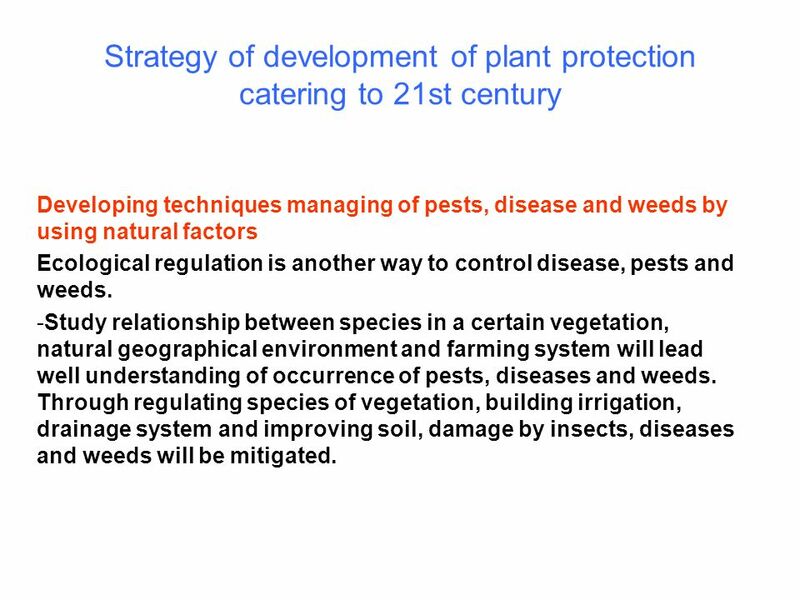 Developing techniques managing of pests, disease and weeds by using natural factors Ecological regulation is another way to control disease, pests and weeds. 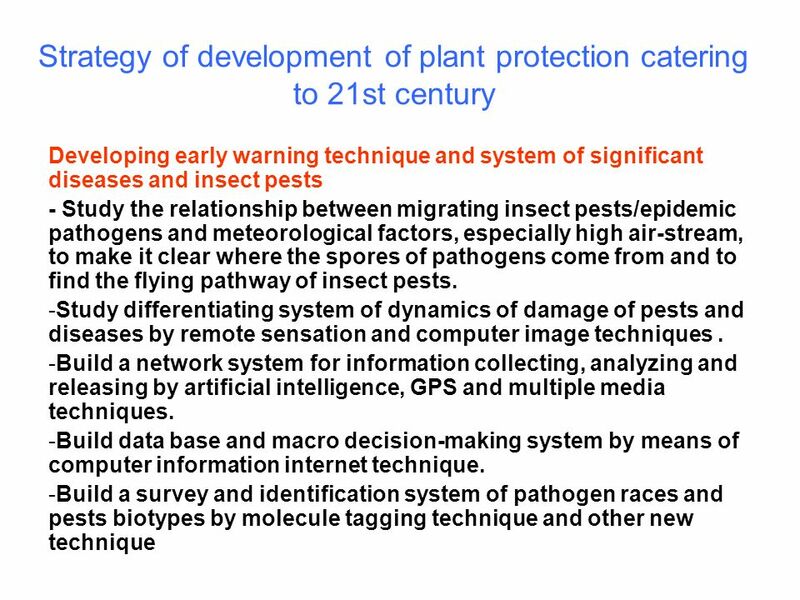 Study relationship between species in a certain vegetation, natural geographical environment and farming system will lead well understanding of occurrence of pests, diseases and weeds. Through regulating species of vegetation, building irrigation, drainage system and improving soil, damage by insects, diseases and weeds will be mitigated. 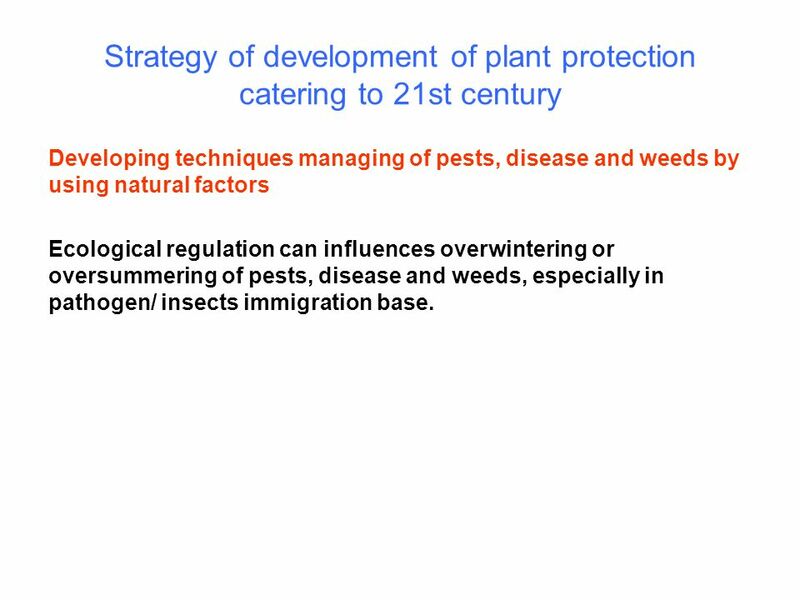 Developing techniques managing of pests, disease and weeds by using natural factors Ecological regulation can influences overwintering or oversummering of pests, disease and weeds, especially in pathogen/ insects immigration base. 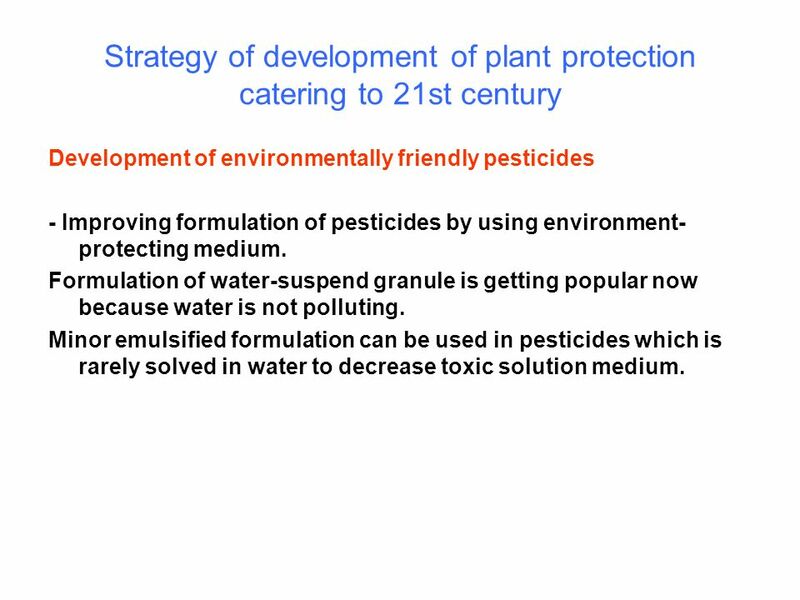 Development of environmentally friendly pesticides - Improving formulation of pesticides by using environment-protecting medium. Formulation of water-suspend granule is getting popular now because water is not polluting. Minor emulsified formulation can be used in pesticides which is rarely solved in water to decrease toxic solution medium. 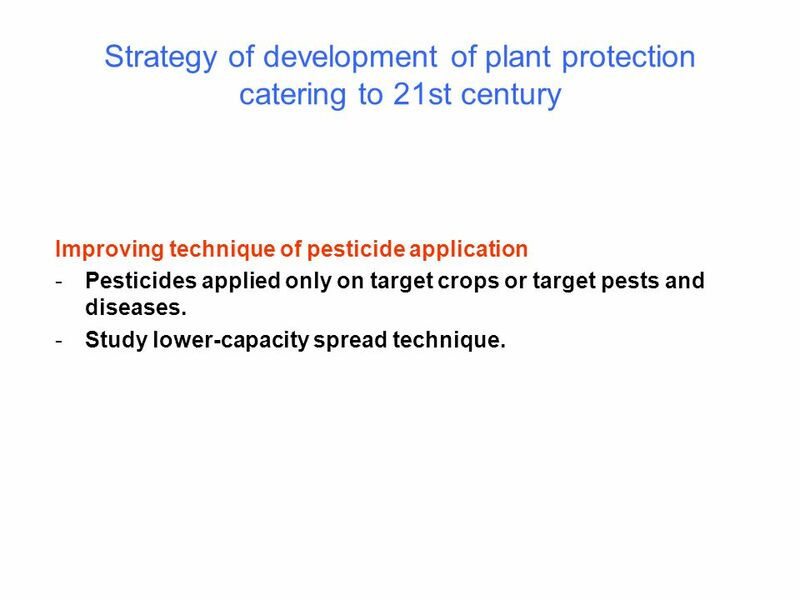 Improving technique of pesticide application Pesticides applied only on target crops or target pests and diseases. Study lower-capacity spread technique. 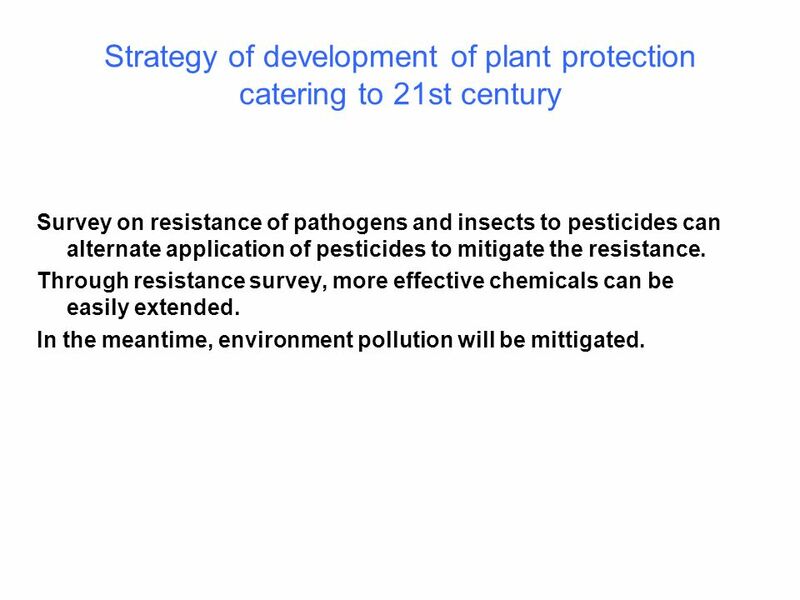 Survey on resistance of pathogens and insects to pesticides can alternate application of pesticides to mitigate the resistance. Through resistance survey, more effective chemicals can be easily extended. In the meantime, environment pollution will be mittigated. 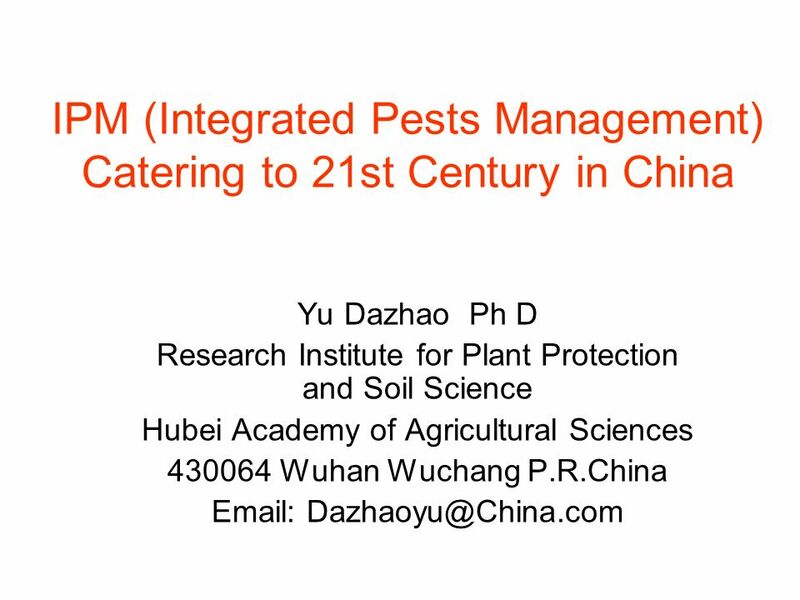 Download ppt "IPM (Integrated Pests Management) Catering to 21st Century in China"
Environmental Science and Biotechnology Objective: Summarize the use of biotechnology applications in the field of environmental science. AGEC/FNR 406 LECTURE 38 Rice Paddy. World Food Production Major links between food production and the environment: 1. Food production relies on good quality. The Management of Water and Land Resources for Agriculture in Chinese Taipei Ho, Yi-Fong Wu, Chii-Reid Asia-Pacific Economic Cooperation APEC International. Identifying Diseases and Pests of Forest Trees. Next Generation Science / Common Core Standards Addressed! RST.11 ‐ 12.7 Integrate and evaluate multiple. Tracking rust diseases of wheat for better production and disease management Berhanu M. Andarge Graduate Student. Pesticide Eco-Alternatives Center (PAN China) Sun Jing. Concept of Pest & Pest Outbreak Dr. Jamba Gyeltshen 19/8/2011. 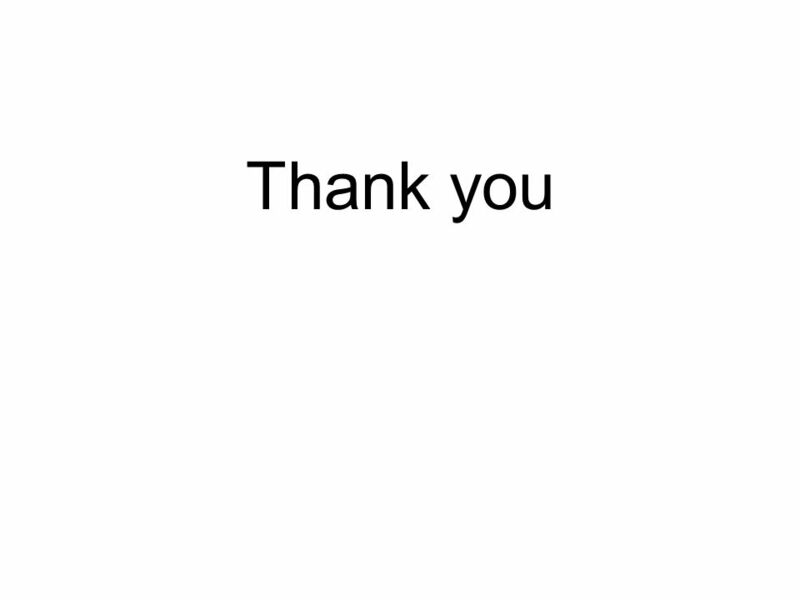 Evolution for Ecology. The Importance of Evolution in Ecology  Ecologists study proximate or “how” questions:  How nutrients flow through ecosystems. MSU Extension Ornamental Pest Management Training for Commercial Pesticide Applicators Category 3b Developed by Greg Patchan, MSU Extension. Gardening Smart! Smart Gardening Using Integrated Pest Management. INTEGRATED PEST MANAGEMENT in PALESTINE. INTRODUCTION - Agriculture sector is considered one of the major productive sector in Palestine. - Scarcity of. Agricultural Entomology. What is Agriculture? The cultivation of plants/animals for Human Use Includes plants used for : Food (Fruits, vegetables, grains. Horticulture Science Unit A Horticulture CD Understanding Integrated Pest Management Problem Area 5. Pest Management Chapter 23. 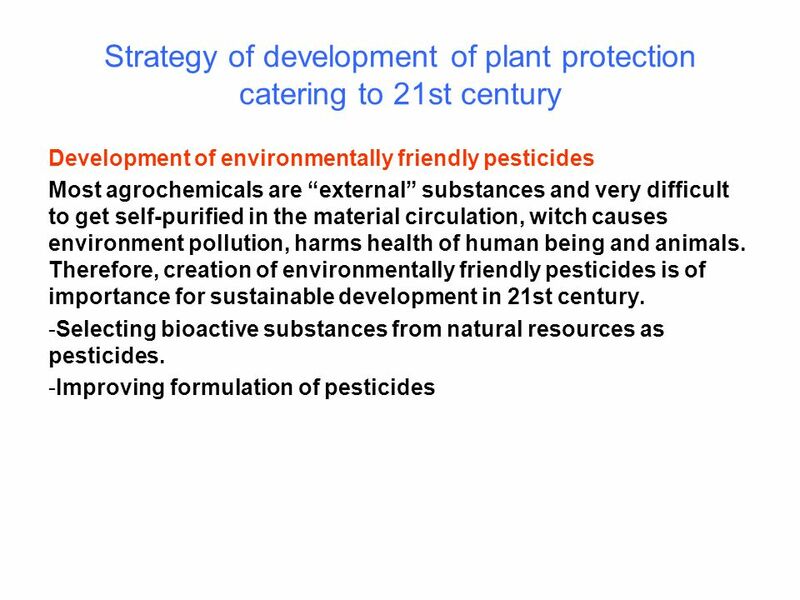 Pesticides: Types and Uses Pest – any species that competes with humans for food, invades lawn and gardens, destroys wood. Meats, Feeds & Grains Abigail Cooke. Overview Meat consumption is growing worldwide –Pork and chicken consumption increasing worldwide –Beef consumption.